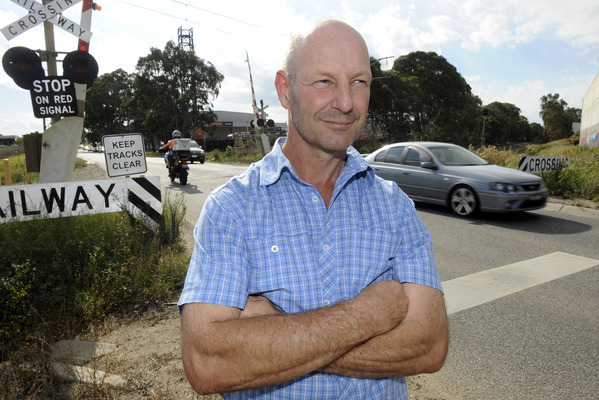 DANDENONG South businesses are fuming over shock plans to cut Abbotts Road in half at the railway crossing. “This would close my business,” Arco restaurant director Lindsay Bull said. He received overwhelming support from 40-plus business representatives when he slammed the Level Crossing Removal Authority (LCRA) plan at a heated drop-in information session at AW Bell on Thursday 25 February. The authority proposed a new road link over the rail line connecting Remington Drive to Pound Road, and “the truncation of Abbotts Road”, which means its closure. The LCRA said there had been two deaths and many injuries at the site in the past seven years and “this option would provide significant benefit to the Dandenong South Industrial Precinct”. It did not put forward any alternative plans. But Dandenong MP Gabrielle Williams said there were other options on the table. “The LCRA has mucked this up,” she said. Ms Williams said removing the Abbotts Road level crossing was an opportunity to address other connectivity problems in the area, including the dead-end Remington Drive. So two weeks ago in Parliament she called for an evening industry forum and is awaiting a date. “Industry are the ones that know best how traffic flows in the area,” she said. “They use it every day. Their businesses depend on those networks. Mr Bull said many Abbotts Road businesses relied on through traffic and had taken out lengthy leases. “They paid a premium to be on a road that has 23,000 people driving down it,” he said. A Level Crossing Removal Project spokeswoman indicated that South East Melbourne Manufacturer’s Alliance (SEMMA), Committee for Dandenong and Greater Dandenong Council supported the project. Traffic would flow a lot better on Remington Drive, she said, and the authority would look at feedback about losing parking on the road. But SEMMA executive officer Adrian Boden said that putting up closing Abbotts Road as the only solution “is absolutely not what we support. “If the level crossing authority wants to put it on the table, that’s fine,” he said. Greater Dandenong Council business manager Paul Kearsley said “it was understood by us that there would be at least three options presented for consideration as part of a genuine consultation process”. “We are both concerned and disappointed that only one option has been tabled,” he said. Committee for Dandenong chairman Gary Castricum said the group was in a difficult position. “We don’t support the termination of Abbotts Road, we only support the Remington Drive overpass to occur,” he said. Mr Castricum said he asked the Level Crossing Authority about leaving the Abbotts Road crossing as it was. “They had serious concerns about the level crossing and that it can’t be left as it is. We share those concerns,” he said. South Eastern Metropolitan MP Inga Peulich has launched a petition at ingapeulich.org calling for the State Government to abandon plans to close Abbotts Road. The LCRA will hold another session with property owners on Friday 4 March and will continue to work with individual businesses. Email contact@levelcrossings.vic.gov.au or call 1800 762 667 with any questions or concerns. Watch Lindsay Bull speaking about the issue here.